ePublishing Knowledge BaseePublishing Knowledge BaseePublishing Knowledge Base Common QuestionsI created a new edition of my publication. Why can't I see it on the site? The Publication Manager allows you to create an online-only publication or an online version of your print publication. This is different than a digital edition, which is often an exact copy of the print edition. The most common reason why you can't see the publication edition you've just created is due to missing a Go Live or Publication date or the Go Live date not having yet passed. To read in more detail for How do I create a new edition or issue of a publication? 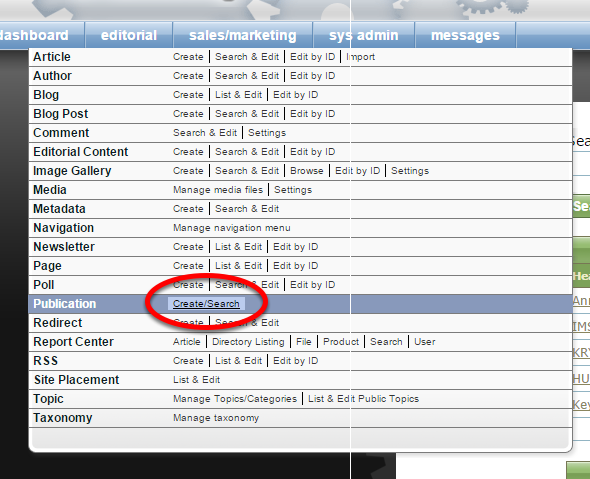 To access your publications, click on Create/Search next to Publication under Editorial in your dashboard. Select the publication you'd like to edit an edition for from the dropdown at the top of the page. Zoom: Select the publication you'd like to edit an edition for from the dropdown at the top of the page. 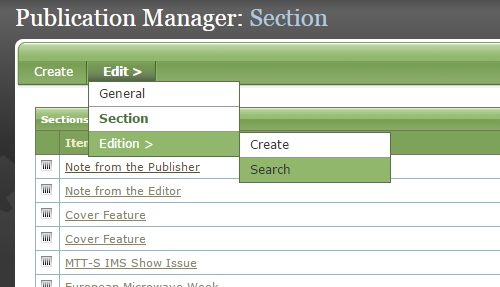 To select and edit an existing edition of that publication, click Search next to Edition under Edit. Select the edition you'd like to edit. Zoom: Select the edition you'd like to edit. Upon opening the edition, scroll to the bottom of the first page and check the Go Live Date and Time. Zoom: Upon opening the edition, scroll to the bottom of the first page and check the Go Live Date and Time. The date and time represents when the publication edition will go live on your website. Set a Pull Date and Time only if you'd like it to be unpublished at any time. Most of the time, the Pull Date and Time will remain open. Now check the Publication Date, which drives which order your editions appear on your publication's landing page. The most recent edition, as determined by this date, will be listed first. Confirm you have set your Go Live date and your Publication Date correctly. If you have, this edition is ready to go! Prev: For the NewsML Feed, what if I want to allow more than 50 articles in a single feed? Next: How do I get my site listed on Google News?